The benefits we have seen through our BIM implementation programme, which began around 10 years ago, include the obvious wins such as improved productivity through reducing rework, with BIM providing a framework to improve consistency and ensure quality, all of which is important for a small practice trying to grow. But we’ve also seen indirect benefits – that of becoming an exporter. We would describe ourselves as an accidental or even reticent exporter. We intended to operate locally in an efficient and meaningful way, and as a typical smaller architecture practice team of 26, our work is very straightforward; we are involved in lots of school projects, housing and commercial fit-outs. However, if we are known for anything, it has been the early application of digital techniques to solve problems around design, programme and budget. The environment we work in at home is extraordinarily competitive. There are 32 architectural practices with the same post code as us, and at least 1000 qualified architects within a couple of streets of where we are based. This landscape meant an increasing need for us to find a way to perform better and punch above our weight. The answer lay in the power of building information modelling (BIM) and specifically the UK Government’s 2016 BIM Mandate – even when it comes to smaller organisations and SMEs, like us. The clarity of the Mandate gave our industry a common target to work towards, and the associated standards have allowed us to structure our practice around tested processes with empowering results. If you add in collaboration, which is the foundation of the BIM process, it has meant that we have been able to get involved with much larger organisations and share knowledge with a much broader industry. It has been through these collaborations that we realised that as a smaller organisation we had it easy when it came to change management and that especially with digital initiatives, organisation size isn’t a barrier to entry. The results of our successful BIM implementation programme have benefited the practice on many levels, but an outcome that we never imagined has been the continued requests for us to share our experience internationally, and we have met and spoken with people all over Europe and more recently South Africa and South America. For example, in June this year, we were asked by the team at Planbim in Chile, led by Executive Director Carolina Soto Ogueta, to share our experience at their conference. The energy and enthusiasm at this event were amazing, with over 500 participants attending, and a further 1500 following on YouTube. Following on from this we were back in Santiago in October at a trade event organised by ProChile; during which we had 17 B2B meetings, of which 4 or 5 feel like they may lead to something more concrete. Our latest international activities have been driven by the Government’s Digital Built Britain Programme: tasked with promoting UK BIM on a global scale by working collaboratively with specific countries. As the UK is seen as the leading light in BIM implementation, the aim is to help other countries to develop their own version of what the UK has achieved regarding the development of policies, strategy and standards. Interestingly, the Chile BIM Mandate has been profoundly influenced by the DBB team and by the UK’s mandate through a Government-to-Government Memorandum of Understanding (MOU). Having worked closely with the Centre for Digital Built Britain (CDBB), we were honoured to be invited to take part in an event on 10 October organised by the Department for Business, Energy and Industrial Strategy (BEIS) and the Department for International Trade (DIT), in collaboration with the CDBB to promote the trade opportunity arising from the international adoption of BIM standards being pioneered in the UK. The event was well-attended by a range of UK construction firms all interested in understanding how UK businesses can look at the potential of exporting, and to realise the value of the skills the UK has in BIM. Richard Harrington MP, Minister for Business and Industry at BEIS usefully described the construction sector as being part of the fourth industrial revolution – a statement we wholeheartedly agree with. The event coincided with a week-long visit to the UK by two high-level delegations from the Brazilian and Chilean governments organised to showcase UK digital construction, both of which we are very familiar with. While some of the larger construction-related organisations discussed their strategic alliances (working in Hong Kong, Brazil etc. ), we were keen to highlight how, as an SME, we have embraced the digitally-led initiative offered through the UK BIM Mandate to not only increase efficiencies but to expand our horizons and look further afield. 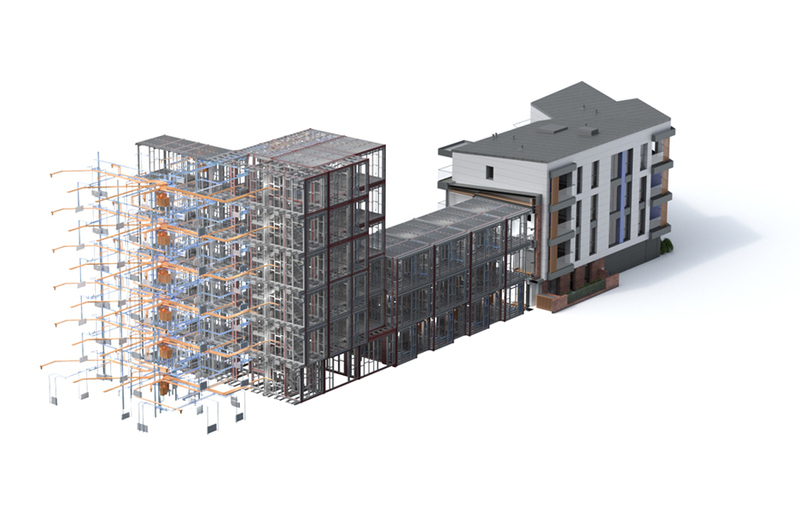 Our message is simple; size is no barrier when it comes to incorporating BIM into businesses. The benefits are far-reaching, not only in day-to-day operations but also on a global scale where we now see ourselves as a willing and able exporter.